What difference does belief in Jesus really make in our lives? Most of us would probably suspect, or hope, that it makes a great deal of difference. We might be tempted to construct hyperbolic narratives about how evil or meaningless life is without Christ and vice versa. That’s not the angle Kierkegaard takes in this classic, though sometimes overshadowed, piece of Christian theology. If we suppose that Christ is the way, the truth, and the life, then that changes things about how we think about truth in the first place, and that is what this book is about. 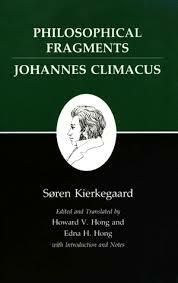 Note: Kierkegaard wrote this book under the pseudonym “Johannes Climacus,” and that is important for his broader purposes, but for the sake of simplicity here I’m just referring to the author as Kierkegaard. One of Kierkegaard’s most famous works is called Concluding Unscientific Postscript. “Concluding to what?” one might ask—well it’s the conclusion to this work, the Philosophical Fragments. This book, which is 1/6th the size of its follow-up “concluding” volume presents all the basic ideas and issues that Kierkegaard will later develop at length, and for which he gets the most attention as an iconoclast that changed the direction of both theology and philosophy. This book contrasts the approaches to “truth” between Socrates and Christianity. (Although, Kierkegaard doesn’t name Christianity as such, this is in essence what he’s referring to when he talks about “the god.”) For Socrates all knowledge is a matter of what the Greeks called ‘recollection’ (anamnesis). We have within us by nature all the necessary conditions for discovering the basic, essential truths of our reality. It is helpful to have a teacher who can come alongside us and help us realize things that might otherwise take us a while—though we could eventually figure them out. The teacher doesn’t add anything to our understanding, they just help us discover our world in a more expedient way. Socrates represents this kind of approach to truth. He is a “teacher” or “midwife” who helps a person deliver the truth they are already pregnant with, so to speak. What if this were not the only way to think about truth? In Christianity, for instance, we think of Jesus as revealing something about God that we could not have otherwise known. If it were just a matter of truth-statements Jesus would be no different from Socrates. Jesus would be a teacher who tells us some unknown information that our minds in their natural state could still comprehend. At that point we would not really need the person of Jesus any further. But Jesus doesn’t just reveal to us a series of facts about God, but rather it is he himself that is the revelation, he is the truth. Therefore any person who wants to “know” (and here the vocabulary must stretch to accommodate this deeper concept of truth) the truth must bring their whole life into relation to Jesus, not just their mind. Truth, in the Christian conception, can never be a mental category. Truth is, the highest truth is, a matter of personal investment and formation. The truth is not a set of factual truth-statements, but neither is it contrary or neglectful of these kind of basic knowledge claims. The truth is something that appreciates basic facts in the framework or context of identification/formation/transformation in the person of Christ. The rest of the book is dedicated to working out the implications for this Christian understanding of truth. What does the fact that we lacked the conditions for truth in the first place say about us? What kind of teaching or truth does Christ’s revelation reveal? How can we relate ourselves in the right way to Christ so as to obtain truth? Doesn’t this perspective make Christianity a matter of history over theology? Great questions! Read the book if you want answers. As the title suggests, Kierkegaard is resisting a way of thinking about the world that places factual knowledge as the highest achievement of human life, displacing the more vital matters of personal growth, integrity, and authenticity. It was possible in his world and is also possible in our world for incredibly intelligent people to be absolute scumbags—and that is a problem Kierkegaard places before us with interesting solutions. The emphasis on formation has a lot of implications, however. For one, it means that its possible to be someone who says “Lord, Lord” and for that to mean very little if one does not actually relate one’s whole person, one’s being, to Christ (Mt. 7:21). By the same token, it is possible to be a nonbeliever and, if one sincerely pursues the truth with one’s whole life (not just the mind), then one will in a sense be much closer to Christ than many confessing Christians. (Though Kierkegaard will later say that such an intense, sincere pursuit will inevitably lead to Christianity.) When we say, therefore, that Christ is the way, the truth, and the life and that no one comes to the Father except through him, our definition of who is “in” Christ and who is not in Christ must be redefined. As the previous reference to Mt. 7:21 illustrates, this is a concept that the Biblical writers understood, but it is a difficult one for an established Church to deal with. This book has profound implications for our churches today. We still live in an age where people are struggling to get beyond the idea of Christianity as just a set of doctrines to agree with—coupled with some social obligations like church attendance and basic moral decency that these doctrines seem to imply. I don’t know anyone who thinks that this is what Christianity is, but I know plenty of people that struggle to come up with a compelling alternative. Philosophical Fragments is thus a great guide for churches and Christians today. The “truth” of Christian doctrines is not found in agreement with the right set of beliefs, or with the ability to articulate them the best way. The truth of Christianity is found on the other side of transformation into the image and likeness of God as revealed in Jesus Christ. The factual aspect of Christian doctrines functions as sound guides towards that fuller and deeper notion of truth, but they are empty by themselves. Only in Christ, as the individual and the community reflect Christ in their being, can truth be found.